I really like Flipboard, and would go so far as to call it my all time favorite app for the tablet. How could I not love it? It actually creates a magazine that you control with constantly updated content from self chosen genres. That is a pretty damn cool app to have at your disposal, especially if you are an RSS junkie like I am. The only complaint I have about Flipboard is that it has never released a browser or desktop version. Since I don’t actually use my tablet that much (I hate having to constantly charge the battery), this is a major con of the service. To compensate, I have usually turned to alternatives like Yahoo! Pipes and iGoogle, but they can only get you so far. Rather than stick with these and basic RSS subscription menus, I went searching for a real Flipboard alternative that would work on my desktop. Or at least something that would run through my browser and work in a similar way to my favorite app. I am pleased to announce that I found a great replacement. It is called Prismatic, and it works on your iPhone, iPad and through most browsers. The idea is very similar to Flipboard. 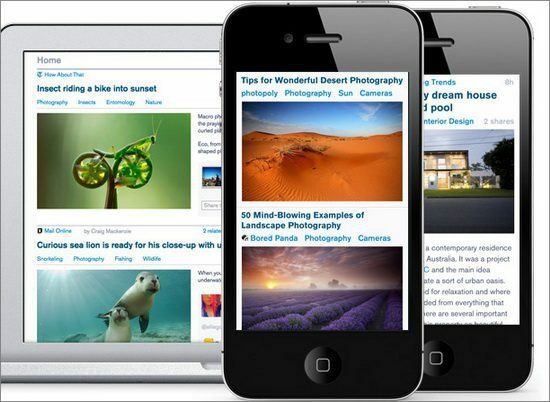 It is a personal newsfeed that allows you to customize it with RSS feeds, categories you want to watch and publications. It curates it all into one place, allowing you to read it with high quality media like photos and videos, broken down into an attractive magazine spread format. Since it connects to your social media accounts if you choose it to, you are able to pull interests from Facebook, Google and Twitter. However, they provide a ‘stealth’ option that works by signing you up with a new account away from any social media links. You just need a username, email address and password. Once you have signed up, it will provide a list of suggested topics to follow. If you have connected to a social media profile, it will target these based on your interests. But if you don’t give it anything to go on, the suggestions will be general and begin to narrow as you select different subjects. This is a great app, and it reminds me a lot of Flipboard. Sure, it has a couple of unique features that set it apart, and the interface is different. For one thing, it is more like an RSS collector than a magazine. But that is to be expected for a browser app, rather than one for a tablet. Check it out for yourself, it is free!